Japanese Episode AG 061: "Kamen no Koodineetaa - Fantomu Toujou! " American Episode 333: "Disaster of Disguise"
Shuu is fighting with a masked trainer known only as "Phantom" when his Roselia gets beaten by Phantom's Samayohru. Later, Shuu sees Haruka at the Shidake Town Pokemon Center and tells her that since his pokemon won't be well in time for tomorrow's contest, he won't be able to compete this time. Haruka is worried that there is a trainer who's strong enough to defeat Shuu, but she remains determined to win with her Eneko. As she trains with her pokemon, Phantom appears and challenges our heroes to a battle. Satoshi accepts, but his Pikachu ends up getting pummeled. 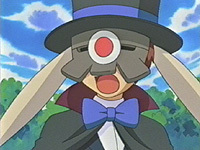 Just as Phantom's pokemon is about to deliver the final blow, the arrival of a limousine causes Phantom to hurriedly recall his pokemon and run away. 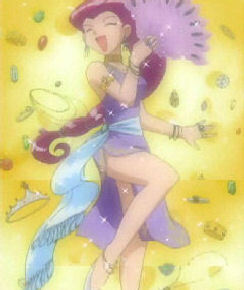 The owner of the limousine, a woman named Kimiyo, spots Satoshi and his friends and asks them what they know about this trainer named "Phantom." She tells the gang that her son, Kimimaro, has been associating with this strange pokemon trainer, and she worries that her son is getting mixed up in some sort of trouble. She takes the gang to her mansion, where they all meet Kimimaro for themselves. After Kimiyo leaves to return to work, Kimimaro's father, Tamuramaro, appears and explains that his son is actually the Masked Coordinator, Phantom! He tells them that Kimiyo hates pokemon, so Kimimaro has been forced to take on this secret identity in order to spend time with his pokemon. Satoshi and his friends decide to help Kimimaro out, so they stage an operation meant to fool Kimiyo into thinking that her son and the Phantom are two separate people. The plan seems to work, and so Kimimaro and Haruka look forward to competing in the Pokemon Contest tomorrow. I really like Kimimaro's story. Seeing a trainer who has to sneak around behind his mother's back in order to play with his pokemon is something we don't see too often in the anime, and it's kind of refreshing to see that EVERYBODY in this world doesn't adore the little critters. I also enjoyed seeing Takeshi dressed up as the Phantom (he hasn't had an active role in the show for a while now). The dubbed version of this episode is probably the most edited (so far) of the entire Advanced Generation series. It has every edit that we've seen occur in the series so far, so those of you who have been bored with the comparisons thus far finally have something to read about. 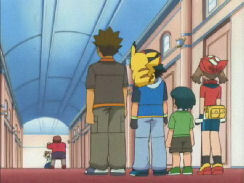 A second is taken away from the panning shot of the Pokemon Center right after the episode's title screen. See more comparison pictures here. The edit was made because of that law that says you can't show real products on-air. The scene where Mrs. Grimm shakes Ash around by the neck in the forest (right before Brock's "Lady, we have never even seen this Phantom guy until just now!") was four seconds longer in the Japanese version. Mrs. Grimm: "So you're admitting it's yours? Then explain why I found it right where I chased the Phantom down in the woods today." Timmy: "Right! I can explain!" Mrs. Grimm: "You'd better! Did he steal it from you!?" Timmy: "It's not like that!" You know how in the dub, the camera switches from the first scene to this shot (when she says "You'd better! Did he--"). And then it switches back to that camera angle for the rest of her speech? Well, in the Japanese version, that was all one continuous pan shot. 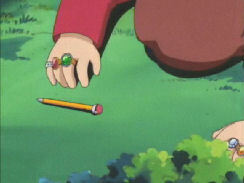 What 4Kids did was replace these scenes (all equal to three seconds' worth) with this shot from a little later in the episode. I can't really see much of a reason for this edit, since it's not like the scene that was cut showed Kimimaro getting hit or anything. I guess the censors thought that Timmy's mom was being too scary or something, so they decided to lessen the impact by having some of her yelling occur at a distance. When Mrs. Grimm shakes Ash a second time (inside her house), she shakes him two seconds longer in the Japanese version. When Mrs. Grimm goes back into the house at the very end of the episode, the camera focuses on the door for a second longer in the Japanese version than it does in the dub.